Maintaining highly trained and skilled adjusters, and based on client-specific certifications, we will ensure the best adjuster for the job. Our experienced adjusters are equipped with the latest training and mobile technology. Our management and owners are part of our team of adjusters. 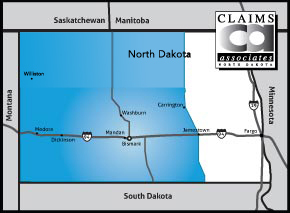 Field Adjustment – Providing coverage in Central and Western North Dakota. Re-inspection and Mitigation – Our re-inspection team is ready to assist you in your audit program. Customer Service Capacity – Our office has more than 100 years experience in the claims business. Customer service is our attitude. Assignment Information: Fax or submit to claims@ndclaims.com Our direct line is 701-250-7976. Our Mission at Claims Associates of North Dakota is to provide property and casualty loss adjustment for residential and commercial claims with the highest quality claims service in the industry by using experienced adjustors with great expertise to provide a thorough product with personalized and prompt service in order to develop a long lasting professional partnership with your company.